Stay close to Peace And Joy Today! Lauren A. Moses is an entrepreneur, recording artist, and speaker. She earned her Master of Business Administration degree from Harvard Business School. After four years at JPMorgan Private Bank, she left in 2011 to launch Peace And Joy Today, LLC, a company dedicated to providing a roadmap for Americans seeking more balanced and tranquil lifestyles. Her “Inspiration Kits” are an emotional snapshot of our country during this tough economic climate, and provide insight into unlocking personal motivation every day. Her first spoken word album, Inspiration Kit #1, has been available on iTunes since January 2012. 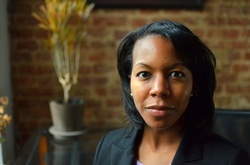 Lauren is also the founder and president of The Moses Group, which consults on talent retention and productivity. She is passionate about employee satisfaction and driving business results. Lauren works with both for-profit and not-for-profit organizations, irrespective of size or industry. To inspire everyone to live at his or her highest possibility--with love, urgency, and integrity. Peace And Joy Today, LLC. All rights reserved.